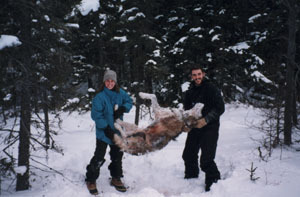 Wolf 381 was first collared as a pup by U.S. Geological Survey biologists in 1991 when it weighed 38 pounds. In 1993, he was re-collared as an adult and weighed 91 pounds. At the time of death, he was almost 7 years old. 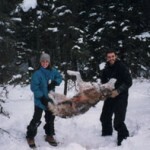 Wolf number 381 was killed by other wolves. 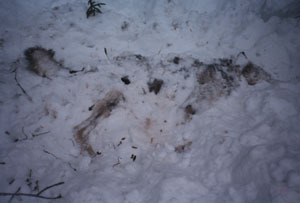 This was evidenced by bite marks at the rump and throat. His radio-collar emitted a mortality signal on January 20, 1998. A conventional radio collar is programmed to emit a mortality signal if the wolf does not move after a certain amount of time. In this case it was set for 4 hours. 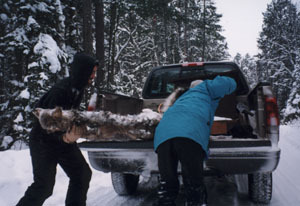 Wolf 381 was retrieved in the field by Kawishiwi Field Lab Technicians, Brad and Brian Lorenz and International Wolf Center intern, Jennifer Zahratka. Gray wolves (Canis lupus) are territorial. Every year a certain percentage of wolves are killed by other wolves in what is called “intraspecific strife,” a conflict over wolf pack territory boundaries. 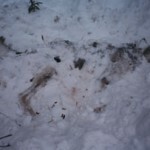 Scientific research supports the idea that wolves run a greater risk of fatal encounters along the edges of their territories than in their centers. Wolves apparently patrol the borders of their territories frequently. Wolves also scent-mark the territory edges about twice as much as the centers. Examination of wolf 381 revealed several interesting facts. It was noted that the toe nails on the left rear leg were very long. Wolf 381 was not using this leg much for some unknown reason. He was also mange infested with about 40% hair loss. Mange is caused by tiny, parasitic mites which cause a wolf to lose most if not all of its fur. When 381 was re-collared at about 2 years old, it was noted at that time that the wolf had broken his left front leg. The leg was completely healed but the injury left a large lump on the leg. So some time between the first collaring at about 5 months old and 20+ months later, the leg was broken and completely healed. Photograph by Jennifer Zahratka and Brad Lorenz.